Racing games are the perfect platform for virtual reality games. Donning a VR headset not only increases the immersion allowing you to look around virtual car cockpits, being able to look into corners, follow the apex and monitor your track position offers competitive advantages too. It’s a shame, then, that the current crop of racing titles available for PlayStation VR headset owners leaves a lot to be desired. Launch title DriveClub VR effectively showcased how the technology could potentially transform the genre, but its drastically downgraded visuals left you with a headache, making it difficult to recommend over the original game. Meanwhile, we’re still waiting for more VR modes to be added to Moto Racer 4 beyond lonely time trials, and while TrackMania Turbo is surprisingly playable in VR, the free update offers limited replay value with only a small selection of VR-only events available. Point is, racing games on PSVR are either too compromised or too limited. The DiRT Rally PlayStation VR upgrade has changed that, however. Available on the PlayStation store for £9.99 or as a bundle with the main game, Codemasters has achieved the seemingly impossible: one of the most intense driving games released in years is even more pulse-pounding in virtual reality. If you thought Resident Evil VII was nerve-racking in VR, try hurtling around blind corners at breakneck speed with the knowledge that the slightest misjudgement will send you careering off a cliff in DiRT Rally. 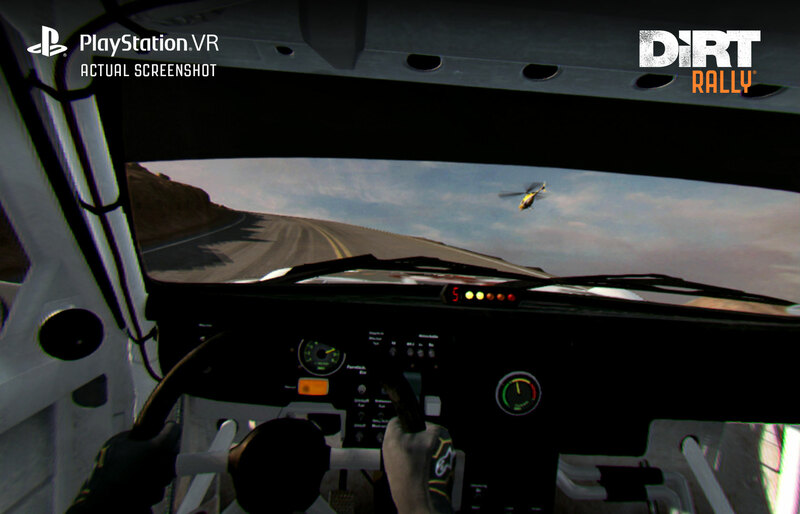 What’s more remarkable, however, is that there haven’t been any serious compromises in DiRT Rally’s transition to VR. DriveClub’s fetching fidelity had to be significantly reduced, while some features, such as the awe-inspiring weather effects, had to be removed entirely to optimise the game for VR. By contrast, every car, track and racing discipline is playable in DiRT Rally on PSVR, and weather effects can be applied to every stage. Granted, DiRT Rally doesn’t have to cope with multiple AI opponents (except for rallycross events, of course) like DriveClub VR, but it’s still an impressive feat – particularly as WRC developer Kylotonn has highlighted the difficulties converting WRC 6 for VR. With so many variables to consider such as different stage, car and weather combinations, there’s a danger that different scenarios will cause the game engine to perform poorly in VR. 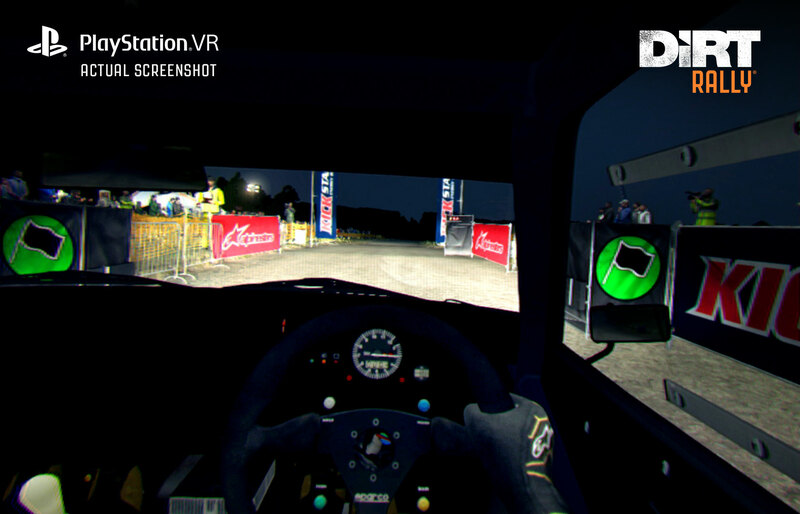 This isn’t ideal because smooth performance is paramount for VR experiences to reduce the risk of motion sickness, but DiRT Rally consistently runs without a hitch on PSVR. Of course, what seasoned DiRT Rally players have really been craving for is more content. Only six rally locations were available at launch, and no DLC has been released since, despite constant player requests – though that’s not likely to happen now that DiRT 4 is on the horizon. Still, you can’t help but wonder why the team prioritised developing the PSVR update rather than creating extra content for DiRT Rally. 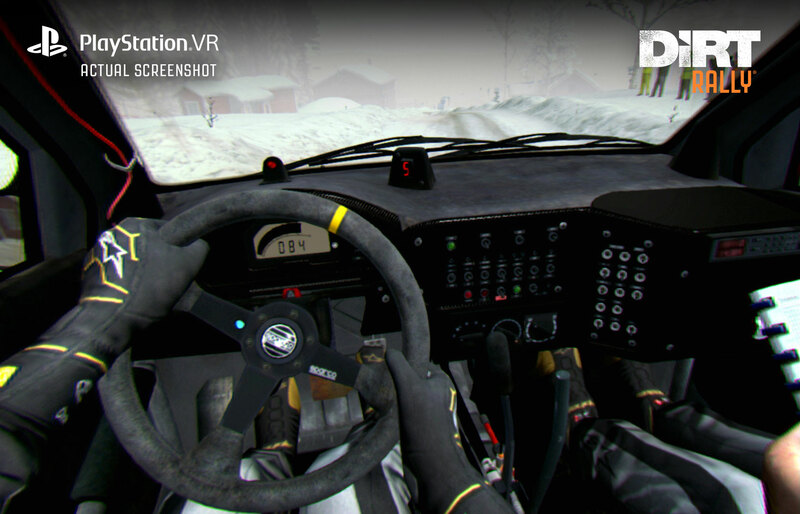 PC players have already been experiencing DiRT Rally in VR on Oculus Rift since last summer. The limitations of the PlayStation VR hardware proved challenging for Codemasters, though the defined specifications of the PSVR and PS4 hardware also made it easier to develop for. “We began developing for Oculus first and then progressed onto PSVR. It was a natural step and made a lot of sense” says Coleman. Navigating the treacherous stages in DiRT Rally is a white-knuckle experience, but the PSVR update increases the intensity considerably. 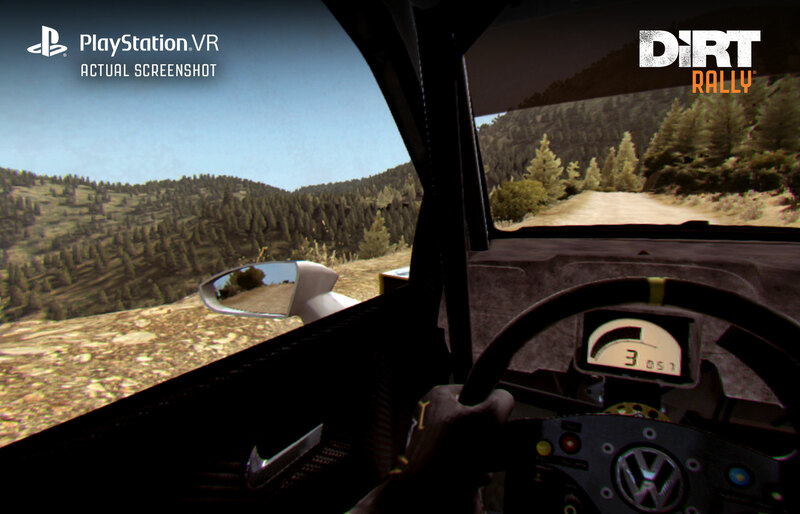 But with stages containing sharp stomach-churning turns and frequent elevation changes, DiRT Rally seems like a VR experience that’s a recipe for motion sickness, but Codemasters’ rigorous optimisation techniques helped reduce the risk. “Both Oculus and PlayStation provided extremely good advice and guidelines and mitigating against motion sickness is part of this. These are areas such as the relationship between your head movement in real life compared to the movement in game,” Coleman explains. “No two people are the same and some will take more time to adjust than others. However, we kept testing and adapting until we were all happy with the results. I’m not the best when it comes to motion sickness. When I started out as a co-driver I used to get horribly sick but it is something that I have got used to over time. I’ve had a similar experience with all VR platforms but I have found that the more you play the more you can get used to the experience.” Explore the settings and you’ll find more comfort options allowing you to map buttons to adjust the driver’s height and seat position. Equip yourself with a racing wheel, and the immersion is incredible. However, the steering seemed more sensitive and the cars lacked a sense of weight compared to the main game during initial playthroughs. This made us wonder if the physics had been simplified for the PSVR update to make the game more accessible. Tinkering with the steering saturation does help, but the handling still seems to lack the depth that made DiRT Rally so challenging. “Just to be clear nothing has changed from a handling or physics perspective for the PSVR update,” Coleman confirms. Whereas the Oculus Rift update was released for free for existing DiRT Rally owners, the PSVR update comes with a £9.99 asking price. This was initially surprising when other PSVR updates, such as the TrackMania Turbo VR update, were released free of charge, but Coleman asserts that the quality of the experience and the resources required to develop the update justify the asking price. 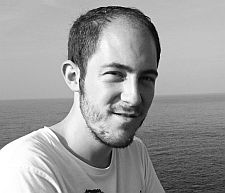 “Making games costs money and developing DiRT Rally for PSVR obviously came with a significant cost. For example, we had to rework all of our art assets as you are now able to see areas of the car that we previously didn’t model in great detail,” he says. Hopefully, we’ll soon start to see more PSVR-compatible racing game releases, but it’s doubtful whether any game will be able to match the unbridled intensity of DiRT Rally in VR.